Initially, each of these poems began with an opening line that seemed to come from out of nowhere. From that point, I began to write what seemed to come next -- whatever felt organic to that first utterance. As always, my revision process involves slow but steady editing and adding to the poem's body. Clarity is the thing I'm after; I tell my students all the time "it doesn't matter how brilliant an idea is if it can't be understood." So, after the first rush of words, I try to figure out what the essential news of the poem is. Then, the process becomes one of searching for fresh language and clearing away all that is merely muttering and stuttering. Ideally, one is left with something readable and memorable. Brothaz in gangs, man, they don’ see no other way. another a whole branch smiling. keep calling, we do not have to listen. The origin of this poem began in the summer of 1999. At the time, I was 17 and taking a poetry workshop course at Columbia College Chicago as part of their High School Summer Institute program. I rode the Blue Line (now the Pink Line) into the south loop for class and encountered the gangbanger in the poem twice, as “Frustration: Off Chest” indicates. 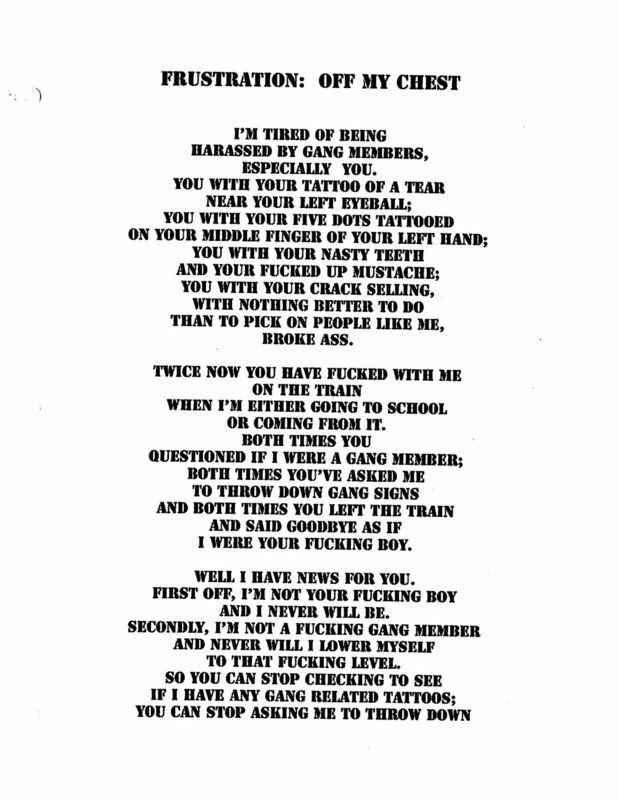 The original draft is really just a rant addressed to the gangbanger specifically but the anger of the poem is born out of multiple incidents with gangs. Growing up, I guess I looked the part of a gangbanger so I would get questioned and checked a lot about my gang affiliation, which was none despite the many gangs in my neighborhood. I grew tired and frustrated with those encounters and took it out on the page. For the workshop, I’d bring in a poem in a different font every week and, that week, I was really feeling the Bold Impact or some such font. The font seemed to fit the tone of the poem. 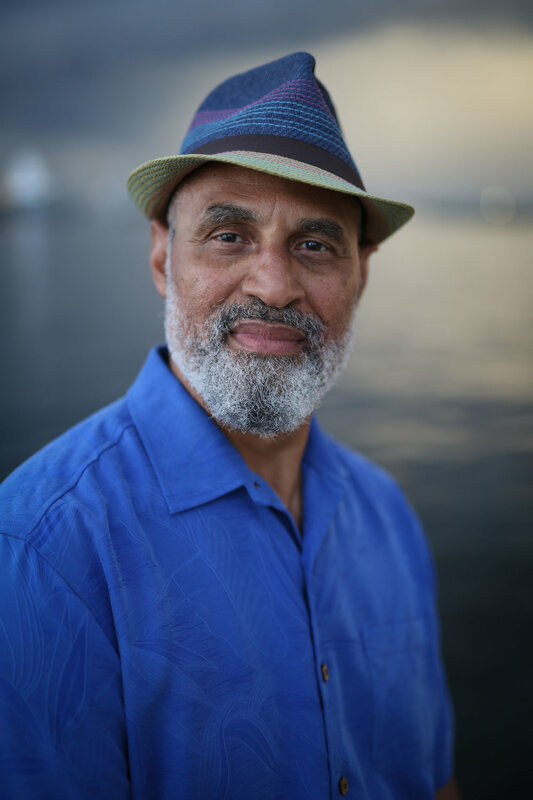 Years later, after enrolling in the Poetry program at CCC, I revisited the poem with new skills and technique I had learned. I wanted to slow down one of the encounters with the gangbanger in the poem and give him more voice. 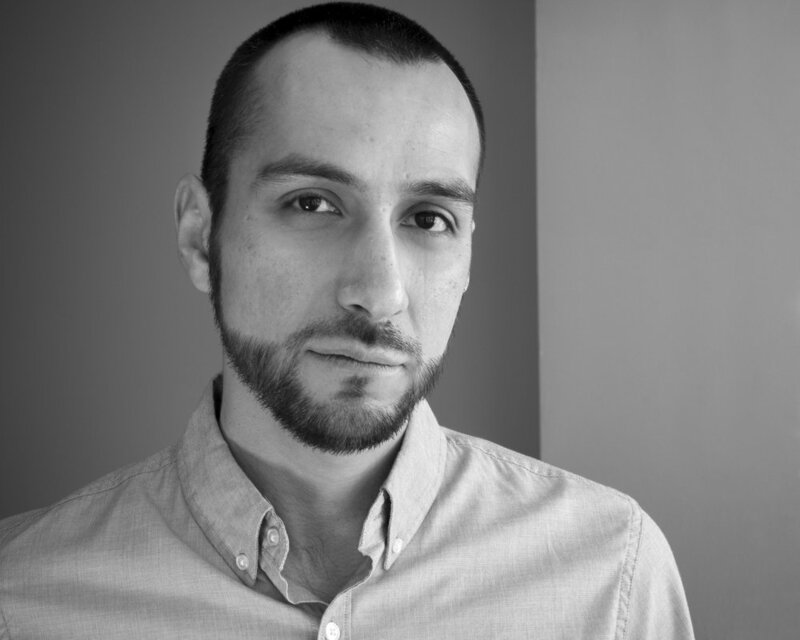 I focused on sound, rhyme, and line breaks as well as metaphor. The bunny in “Blue Line Incident” is a reference of the symbol used by Two-Six Nation but it also works for showing how helpless and scared I felt at the time. I cut down a lot of the curse words used in the original but I still wanted to maintain some of the anger and frustration I felt at the time, hence the violent fantasy. I didn’t intend to have it end as a “pen is mightier than the sword” motif but it seems to fit the poem. “Blue Line Incident” originally appeared in RHINO magazine. not to get shot, stop after stop. Hey, who you ride wit’? Let me see—throw it down then. they’re my boys, my friends. Sometimes, the more I want a poem to proceed, the more the process begins to feel like an interrogation or immigration interview. I respond by pivoting on the page and writing myself into a corner or through an easy exit. I know when I’ve done this because the poem will suddenly claim to have nothing more to say, though the document will remain open on my computer and I will mull lines aloud while I go about my day. When I draft, I have to be cognizant of this impulse to turn away or show myself out and how it tricks me into thinking the work of the poem is done. I move away the lines or sentences that lead me into insincerity as they appear and approach the material again. My drafts are full of pages of these bob-and-weaves, misfires, false starts, diversions, and dead ends. Honing requires patience on my part—and this poem in particular had to trust me. shrieking, Watch out! from our open door. but a family friend with her hand out to him. too much would make it explode. and crawl spaces—anywhere snakes could build a den. and waited for him to power on the lights. to not say anything that might set him off. that might set him off. who lived in the States. too, had shoveled a den for plastic snakes. want to laugh. We cousins turned out okay. and yelled “Watch out!” at his face. behind you, watch out when you walk home alone. And what wasn’t, but I’d already said too much. My poems always start from notes. I went on a kind of a scavenger hunt through notebooks. 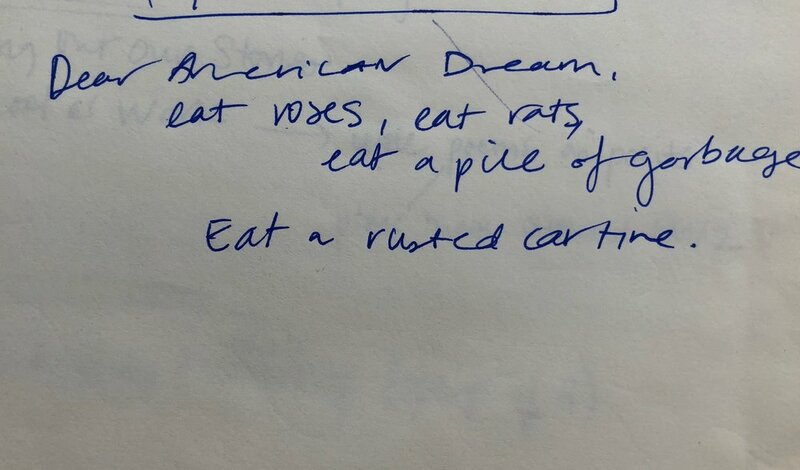 What I found from my notebooks: "someone in the apartment next door thrashes their furniture," an image of ants, "the dripping sink, the neighbor's feet above me," and then this thing I wrote: "Dear American Dream, eat roses, eat rats, eat a piece of garbage. Eat a rusted car tire." All of these ideas swirled into my head as I wrote. I remember this poem being a heartbreak poem. And how everyone around me kept saying: "Well, at least there's something to learn from every heartbreak." I remember thinking: what is there to learn? 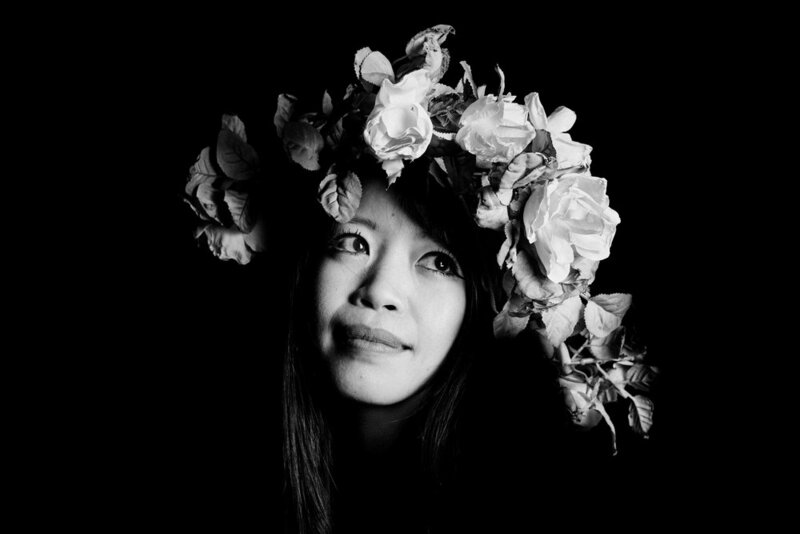 Should I learn to be more pleasant, more polite? Less "intense"? And I ended with this poem here --- which strangely goes back in time and asks: what can I learn from the wisdom of my younger self? What can I learn from my family's experience with heartbreak (my parents' arranged marriage, the American Dream)? The answer, by the end, seems to be clear: I must remain myself. Do not lessen, do not be swayed by false promises. Also, in revision, I've started recording myself and revising after listening to the play-back. Something about hearing my voice/the breath helps. You can see that via the stanza breaks. The poem originally appeared in The Adroit Journal. I lay against my floor, if only to feel that kind of affection. Get up. You can not have what they have. A trickle of water is no joke. I’ve learned that. Get up. The ants pouring out of the sink, onto my arms in dish heavy water. To let myself be consumed for what I can not control. What is made and un-made. of the sink, onto my arms in dish water. No one told me I’d have to learn to be polite, to let myself be consumed. I must return to my younger self. I will pretend not to know. I don't always love sharing old work. Not because I'm ashamed of its quality (that's not a feeling I enjoy, but I can move past it), but because when you write anything, you embed your ignorance and prejudices into your work. Of course, this shows in your finished pieces as well, but by then you've had a chance to examine yourself and your work, and have had the ability to perhaps do some change. An early draft can expose potentially hurtful or oppressive language—thoughts that were unconscious and demand reexamination, sentences in which you didn’t know what you were even trying to say, and lines that contain ambiguities that allow for readings you don’t believe in. Language can put others at risk, and I think it's important to try to consider that risk. The sextant section changed because whatever story I had been trying to tell could never be as loud as my being a man telling a woman her own feelings: “you thought a moment...” That became especially evident when it was re-contextualized in a poem specifically about this kind of assumed power. As uncomfortable as it was in this case, I would rather embody the man. 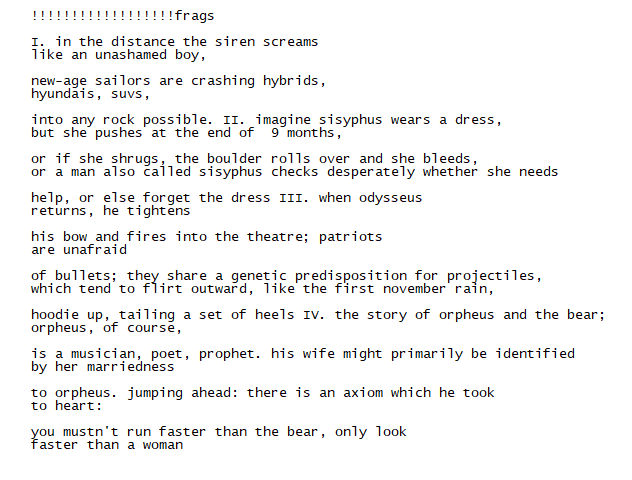 I also changed the Sisyphus section, which in earlier versions felt to me as focused a lot on the dress. I couldn't decide what that meant, precisely, but it seemed to mean something concerning gender expression—that people who express themselves in what is considered non-masculine attire are saddled with the responsibility of men's actions. I wanted to allow for that read, but not position it as the only way to interpret that section. I felt uneasy with what I was trying to say in scrapbook (or rather, whether I was saying it) up until the night before it was published—and asked close friends to read it, and read it myself, and sent late night edits to the editor. Maybe I still worry. Privilege is power, and some forms of privilege cannot be put down, no matter the effort to do so. Writing a poem like this can feel like gesticulating passionately with a gun about all the firearms in a room in which some of the people are holding guns, all the while hoping mine doesn’t go off. The alternative feels like merely holding it—deadly quiet—in my hand. This poem was first published in Triquarterly.